Discussion in 'General' started by Awaké, Apr 25, 2018. I was wondering if someone with Alpha invite want to jump on and check out some stuff together, or if we have enough to run a "guild" group for dungeons or what not. I've had alpha since 10th of April and had some few goes at the changes I've seen, and tested out how paladin (ofc) feels with the number changes and gcd changes. But I haven't leveled above 110 yet and as I said mostly check in to take a look at the new additions. Let me know if there is something you want to maybe have a look at together and we can schedule a small session one day. Edit: All characters were wiped when they transitioned into Beta, so yeah, all new and ready to go again! What does his mean? I don’t need a alpha invite? So All can do beta testing now or so I need to sign up and pray? I’m prolly in for playing beta. There ain’t much to achieve outside raids anymore except pushing m+ score which will be useless in bfa so I’d rather do the beta and prepare. You will still need to have your account flagged to participate in the Beta, since they will be giving out plenty more and increasing server limits as they have transitioned from Alpha, I would hope a bunch of us would hopefully get invited too. I'm gonna flag my account for the beta when i come home and hope for the best then. I would go on to get some overview of the zone, a little heads up to not get stuck in the middle of hell on launch. Check out some dungeons to get used to it for M+ etc. For raids we go in blind, it is the only thing we do together as a whole for months and months on end, so to not follow a guide and follow a 100% routine by the time you set your foot inside the instance, gives it a little more life and enjoyment of killing stuff in the long run. Pick Anduin as server btw, thats where most of were during alpha. I checked my profile on the BETA sign up now, i see overwatch heroes of storm and all that, as well as "Warcraft" Is warcraft World of Warcraft or more WC3 etc? Yeah, it's just the different universes. 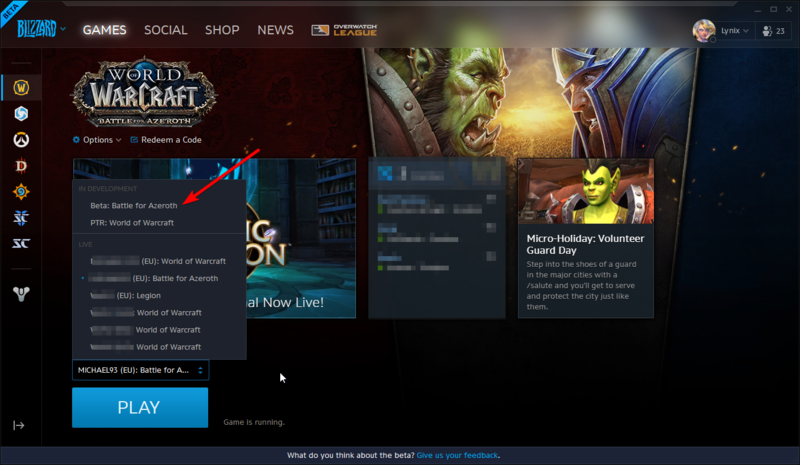 So if let's say there's a Warcraft 4 alpha coming out, you might get that as well. ....I just got a email saying I got into the Beta too, prob just an update since they've transitioned. So that's at least the current people who've access that is getting updated emails, then the new invites are coming out soon enough I'd think. Which server you pick doesn't actually matter. They're connected like Turalyon / Doomhammer, so you can still join guilds cross server. Although obviously only horde scum belongs on Sylvanas, Anduin best server. Me neither :/ Gief now plz! Didn't you 'just' opt in the other day? I went in to check, but I already signed up for beta some time ago, or it might be still on since burning crusade when I played tons of wow not sure? Do I need to go in and update or something? Horde scum gets updated dummies in their troll city, Alliance has none in Boralus so going Horde makes more sense atm. Idk how it'll be on live, but atm Horde and Alliance gets 4 different dungeons each. Atleast at low level normal dungeon queue'ing. It's not like you can't do both horde and ally though on the beta. Gotta do the stupid scenario for each character though unless things changed. Either way, when we did our Alliance group (for those juicy Dark Iron Dwarf racials) we could do all of dungeons through a mixture of talking to an NPC with pre-formed group and LFG. Which NPC did you talk to to do the horde dungeons? As Alliance you mean? Some Ethereal model guy in Boralus. He is surrounded by traders but one level below the inn IIRC.